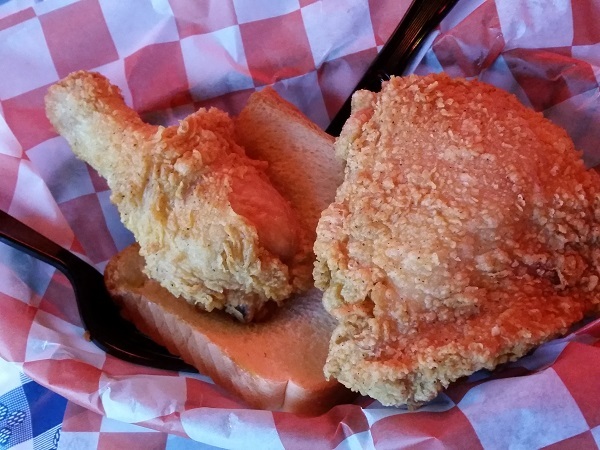 Champy’s World Famous Fried Chicken, Athens GA – Marie, Let's Eat! Last month, Marie and I celebrated our anniversary, but instead of having a simple date night – or a complicated date night – we decided to have a family day in Athens. This resulted in a little grumbling from the teenager, who wants to be included when she’s left behind, but left behind when we include her. Happily, even she had a good time in the end. We tried to juggle several things that everybody would enjoy, starting with a long stop at Washington Farms, outside Watkinsville. We picked three buckets of strawberries, and the four year-old probably ate a fourth on his own, so we didn’t complain about the price. Four for the price of three’s not bad, really. We packed our coolers with ice and strawberries and made our way to Baxter Street, where Champy’s World Famous Fried Chicken opened its fifth location earlier this year. We really enjoyed the fried chicken in their original store in Chattanooga. We’ve been there twice (here’s a story about our first visit) and think it’s super. From the Scenic City, Seth Champion then oversaw the opening of three stores in Alabama, and this latest franchise, run by Josh and Amy Collins, is every bit as good as what we enjoyed in Tennessee. Their choice for a location concerns me a bit, however. You know how some restaurant spots just seem cursed? This is one. In the early 1990s, a Hooters was here, and there have been at least seven others since, most recently a fish place called Off the Hook. Before we started dating, Marie and I had dinner in this building, at a Mike & Ed’s Bar-B-Que. We’re too old to believe in curses, though, right? The chicken here is just delicious. The meat’s incredibly juicy, and we love that salty and crispy skin. It may not be in the absolute top of the list of great chicken joints, but it’s still way above average and priced right. They do very good work here. We all shared a three-piece meal and a two-piece snack, with bread, fries, beans, and cole slaw. For four people, that was just enough to give everybody a little something, what with three additional restaurants planned on the trip. I’m of the opinion that better fried chicken doesn’t need sauce, and neither do wings for that matter, but in the event you’re going with tenders or want something interesting in which to dip your fries, Champy’s has a whole big line, including the barbecue and ranch that you’d expect at a chicken place, but also a few other neat things. 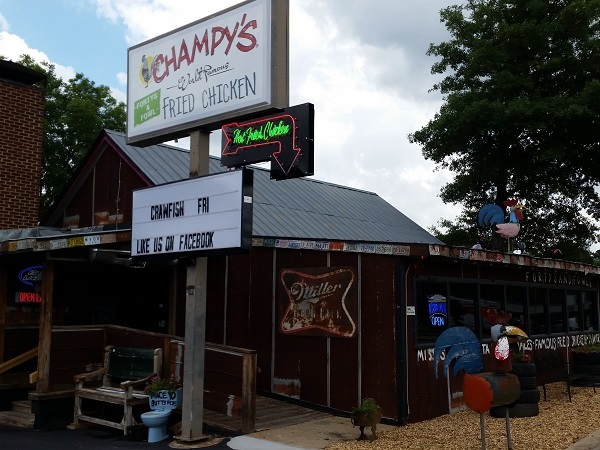 The Champy’s sauce is not miles removed from the sort of remoulade chicken sauce popularized by Guthrie’s and seen at many similar restaurants, and it’s quite tasty, but the Sweet Heat is what you really want. It’s a terrific, medium-hot vinegar-pepper sauce and I enjoyed it a whole lot. There wasn’t much of a crowd when we were there, and in fact, compared to the big mobs in Chattanooga, the place was downright dead, but the summertime is honestly real slow for Saturday lunches in Athens. Opening in the spring in a college town is not the move that I’d make. You want to make regulars out of as many students as possible so they’ll remember you in the fall. Hopefully, they got a good few hooked before finals and they’ll be back in August. I really don’t think that there’s better fried chicken in the area, so I’d love to hear that this place is thriving. Posted on June 29, 2015 August 22, 2017 by Grant G.Posted in athens, chicken, georgia, regional chainsTagged athens, chicken, georgia, regional chains.